This Before and After is a bit more dramatic than the last one I shared. Unlike the autumn shot near Tippin Rock, I actually changed the scene a bit for my shot of “Friendly Bucks.” It’s not something I do very often, and these days I’m more tempted not to use a shot than to change it significantly, but in this case I justified altering the background due to the unique context of the subject and the fact that the background alteration drastically improved the final image. The original photo was taken in 2006. I loved the moment captured, but the white corner of sky in the background was very distracting. To improve the straight out of camera version, I fixed the white balance, leveled the horizon (which resulted in a slight cropping of the edges), and cloned the mountain part of the background to fill in the white sky. All of my images have slight tweaks to exposure, shadows/highlights, blacks/whites, contrast, clarity, and vibrance/saturation, but this one required a little more work than that. The end result is something that is much more breathtaking. 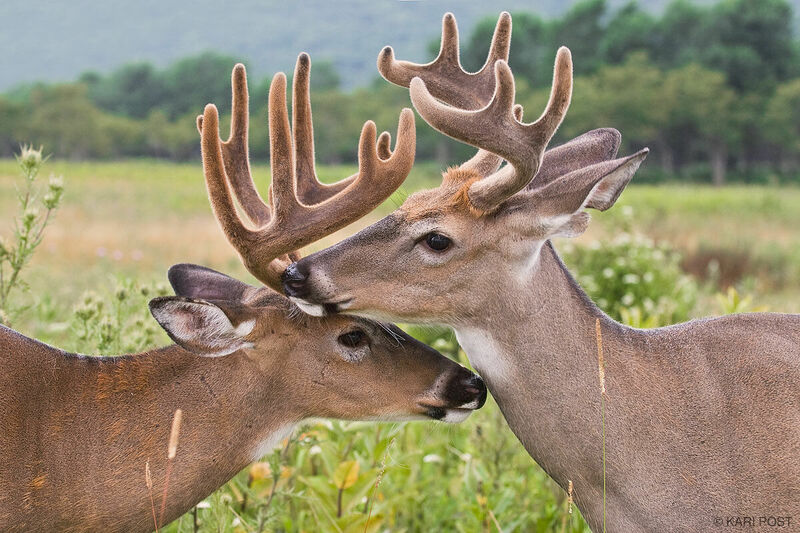 Two White-tailed Deer (Odocoileus virginianus) bucks in velvet nuzzle one another while taking a break from grazing in Big Meadows at Shenandoah National Park. Now there are certainly folks who would frown on the level of manipulation inherent in changing the background of a photo. I don’t disagree with them, and I would never enter the edited version of this photo in a nature photo contest like the Wildlife Photographer of the Year Contest, which requires that photos are not heavily manipulated or altered, or claim for it to be a photo documentation. By adding or removing an element of the scene, it is altered beyond the point of standard adjustments, and I am honest about that and would never try to pass it off as an original representation of my camera’s view at that time. I don’t regret capturing the scene from this angle, because by doing so I was able to get both bucks in the same focal plane, which might not have been possible if I had shifted slightly to have a cleaner background. This interaction also lasted just seconds, and the fact that I captured it at all is something I am proud of. The goal of my photography is to show the beauty of the natural world and capture moments in my life that are important to me. This photo does just that. Changing the background results in focus falling right on the two deer and prevents the viewer from being distracted by a bright part of the image that detracts from the subject. It enhances the beauty, and accurately represents what someone standing next to me might have seen. Since the point of the photo is the interaction between the bucks, altering the background helps me accomplish my goal. To me, making this change on this photo was, and still is, the right decision. 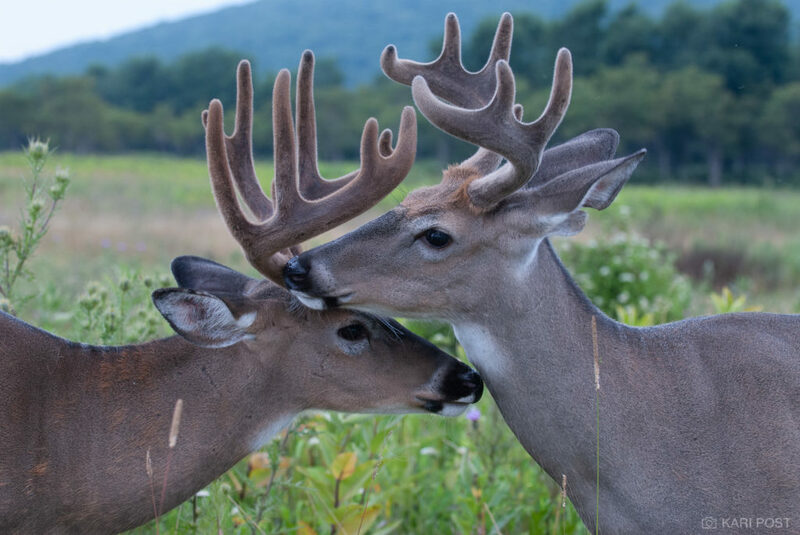 Posted in Before and After, Photography and tagged before and after, bucks, deer, nature, nature photography, photo editing, photography, post processing, Shenandoah National Park, SOOC, straight out of camera, VA, Virginia, white tailed deer, wildlife, wildlife photography on October 28, 2018 by Kari.